There are days when I love playing with recipe ideas in the kitchen, but that is not always possible. My family scatters to the wind when sports games and work schedules collide. That’s when I love easy. And this delicious and beautiful Lemon Berry Trifle is just that. You can put this trifle together in under thirty minutes. Once it’s all put together, just refrigerate your trifle until needed. No baking required, just mix up your fillings and layer away. Choose your favorite cake for your trifle. Of course, yellow or pound cake is the traditional choice for trifles, but don’t let that limit you. Chocolate cake combined with strawberries, raspberries and blueberries is a delicious option. Spice cake combined with blackberries, raspberries and blueberries is a completely unexpected and delicious combination. Let your imagination run wild and try all sorts of flavor combinations. 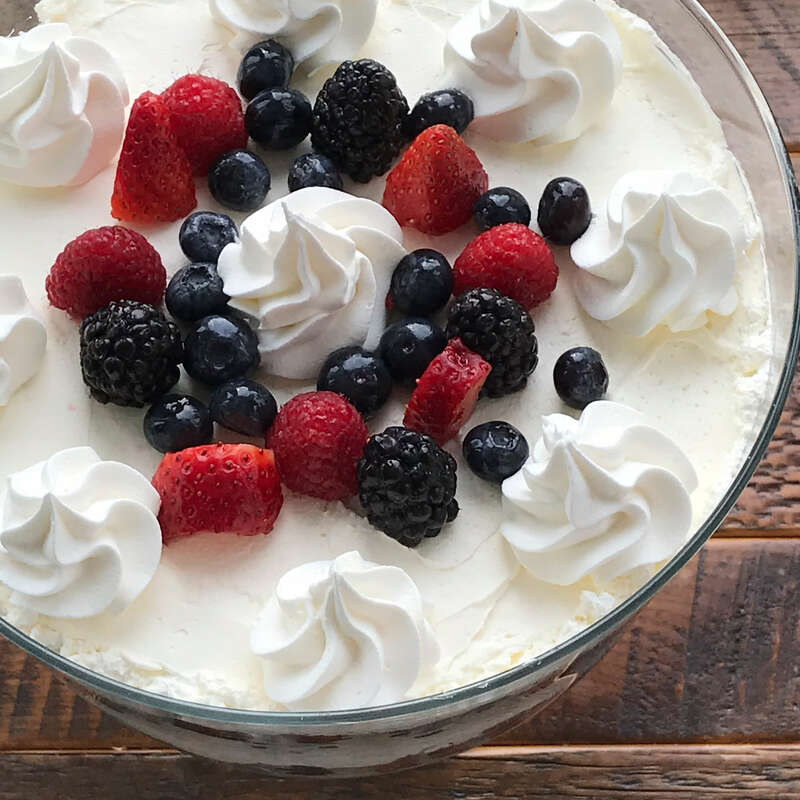 Perfect for a busy life that needs a last minute dessert, this lemon berry trifle will always be a hit. For more delicious gluten frees recipes, please visit our recipe page. Place cleaned and dried berries into a large bowl. Add granulated sugar, gently tossing until well mixed. Allow berries and sugar to sit at room temperature for at least 30 minutes to allow a syrup to form. In another large bowl or a stand mixer, whip the cream cheese and whipped topping together on medium-low until combined. With mixer on low, add lemon zest and juice, blending until well combined. Break cake up into bite size pieces. Once a syrup has formed from the berries and sugar, you can assemble your trifle in a large trifle bowl or 12 small trifle bowls. Place an even layer of the whipped topping mix on the bottom of the bowl. Use the back of a spoon or an inverted spatula to even the layer out. On top of the whipped topping mix, place a layer of cake pieces, facing the prettier pieces along the outside edge of the bowl. This layer does not have to be completely even or full. 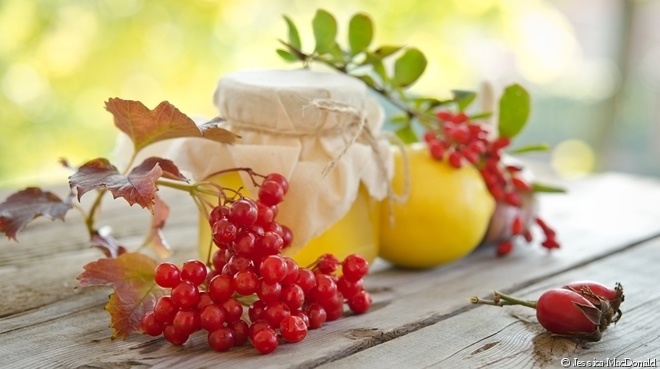 The berries will fill in any gaps. Spoon a layer of berries and its syrup on top of the cake pieces. Repeat the layers until you have reached the top of the bowl. Top with a final layer of whipped topping mixture. Cover top with plastic wrap and refrigerate at least one hour until well chilled. 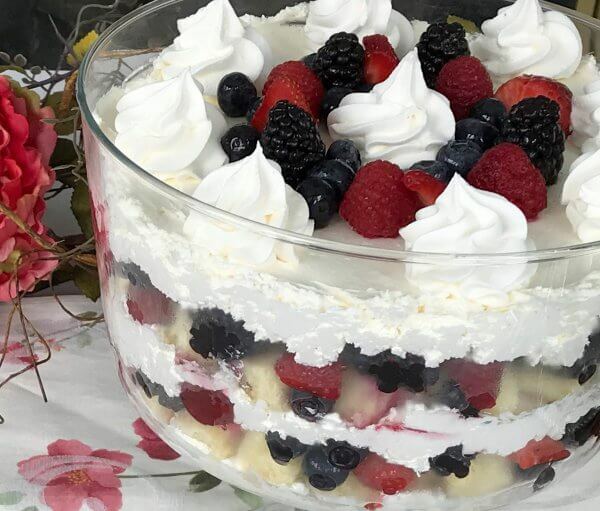 Right before serving, decorate the top of your trifle as desired with more whipped cream and berries. This Lemon Berry Trifle recipe is gluten free.